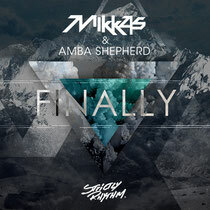 Amba Shepherd, who’s featured on collaborations with Hardwell, Ferry Corsten and Porter Robinson among others – teams up with Danish producer Mikkas for the their new track ‘Finally’ (not a cover of the KOT classic!). The duo discovered each other through working on separate tracks for Porter Robinson, Amba singing on ‘Vandalism’ and Mikkas remixing ‘Unison’, and figuring they shared a musical vision, wasted no time in getting creative. Mikkas, who is currently riding high on Beatport with his remix of Emma Hewitt’s ‘Rewind’, underpins Shepherd’s distinctive floaty vocal with a set of strong electronic rhythms linked by dramatic, melodic drops for the main event, while Botnek supply the tweaked up glitchy remix. It's out January 22 on Strictly Rhythm. Check the video teaser below.